Goody Bags Image Jennifer D.
Goody bags themselves have always presented a conundrum to me. On the one had, apparently it is a sin to send kids home from a party without one. On the other hand, they are usually filled with junk that ends up cluttering up geekette’s room. Goody bags at our house have been known to disappear and then mysteriously reappear with only the useful things still inside. I call it the goody bag yeti. My daughter was convinced we had a yeti living in our backyard when she was little so let’s just go with that. (She used to be convinced we had an ice troll in our freezer too, but that is another story). Decorative Tin Pail : the ones at Target were Yoda and one with Luke, Vader, Emperor, Yoda, the Death Star, and the Millennium Falcon. A stress ball in the shape of C3PO’s head or Vader’s head. C’mon, first grade can be stressful. A pair of ink pens: one with Yoda and one with Obi Wan Kenobi. When you click the button, it scrolls through several of their respective quotes. Light up Yoda yoyo . Say that 5 times fast. 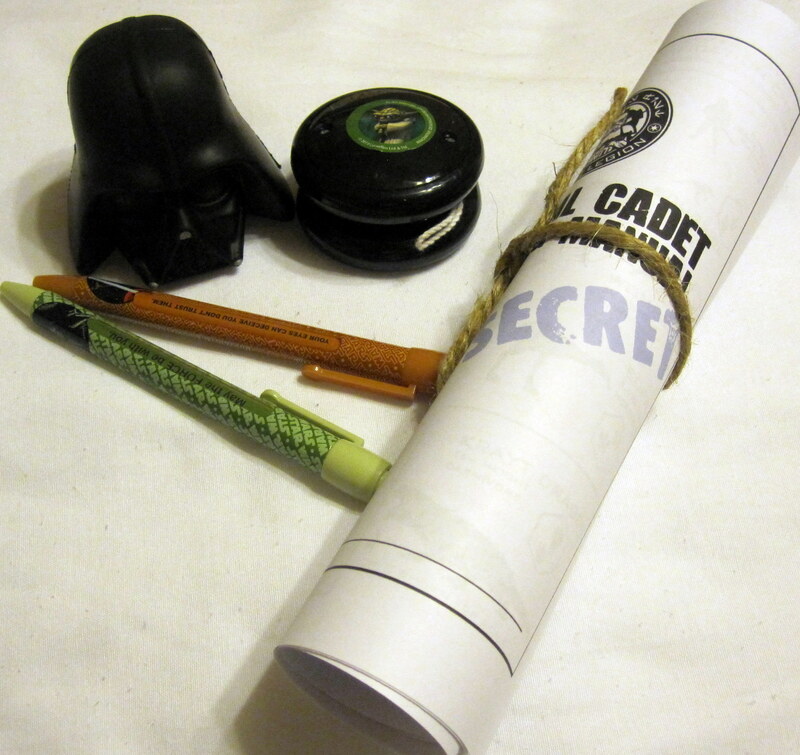 The 501st Imperial Cadet Training Manual: these I printed off, rolled up, and tied with some jute string. Contents of The Bag Image Jennifer D.
In addition to these items, each child gets to take home their own pool noodle lightsaber. If you really want to up the ante for the saber battles, print off some masks for the kids. They have characters from the original series, Revenge of the Sith, and Clone Wars. 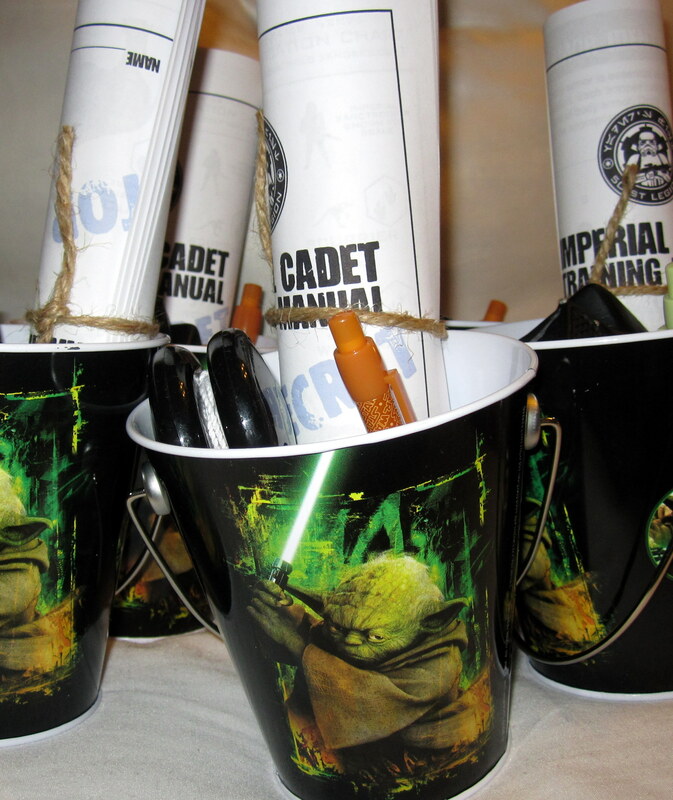 For Star Wars specific goody items, you can check out the craft pages at StarWars.com. They have a ton of ideas not just for goody bags but also crafts you could do as activities at the party. Today’s Mama also has some excellent ideas on goody bag fodder for other themed parties. ← Meet Our Sponsor: Nannek, and Enter the Chore Pad HD App Giveaway!